Pinterest. Ahhh. I don’t use it that often, but when I do, I’m pinning for an hour. When researching for this post, I found myself abandoning my work to follow new boards and make a few of my own. 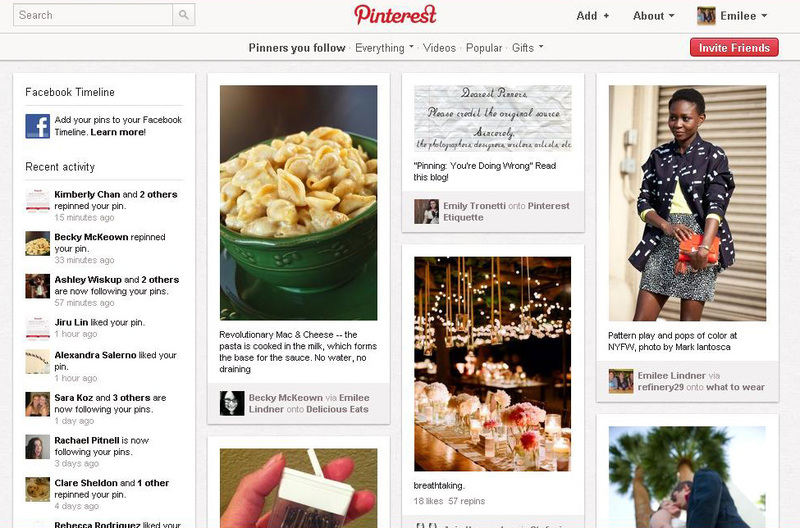 This is what a Pinterest homepage looks like, if you aren’t familiar. Pinterest is kind of like Tumblr, which I use more frequently. Users can repin (or reblog) photos they like. The photos should link to the original source. When people click on the photo, it’ll take them to the site where it came. These pins act as teasers for more content — a more visual way of sharing. Recently, Shareaholic reported that Pinterest is a leader in referral traffic, right under Twitter. However, as photographer Emily Tronetti points out, people are doing it wrong. Instead of sourcing their pins to the artist, they grab the photos from Google images or Tumblr or We Heart It, a site very similar to Pinterest. Or sometimes people take from sites without giving the proper credit. I think this is a great idea. Online piracy happens every millisecond, and this is a way of combatting it — or at least taking responsibility what happens on Pinterest. This doesn’t prevent people from saving an image and uploading as their own. It’s difficult to police the piracy, but artists can request to have their work to be taken off Pinterest. For ways to battle this online piracy on Pinterest and Tumblr, follow Emily’s tips. ← Should Republican candidates become masters of social media? Thanks for the “link love” Emilee! This is definitely an interesting topic. I’m interested to see if this code is enough to satisfy the people who are concerned about Pinterest and their copyright/piracy issues. Of course, it does makes me wonder why people aren’t making this big of a deal about Tumblr. However, I went through and deleted my images without original sources on my Tumblr as well as my Pinterest. It took… days. But I do feel a lot better now that I’ve done so!